In this episode of Inbound Sales Journey, Gray and Ryan talk about how to use metaphors to close more deals. Sometimes on a sales call with a client, when explaining marketing tactics or strategies, you may find yourself entering the weeds and getting more technical than you need to. There’s a lot of jargon in modern marketing and clients may not have the best grasp at what you’re getting at. A confused prospect is one that is not likely to buy. To overcome this sales hurdle, one tactic to use is metaphors. Metaphors help you explain more technical services in a way that’s relatable for the prospect. You want to effectively communicate the value of the service or strategy in a way that the client understands. One example of when we use metaphors is when we sell GamePlans. Ryan’s background in home sales helped him describe a GamePlan to a prospect as a blueprint for a house. You don’t start building a house until you have a clear idea of what you want it to look like and ensuring it has everything you need before you begin construction. If something isn’t done right, it can have a catastrophic impact on everything else. You want to keep it general. Sometimes you can go too far with an analogy (“and the cabinets in the house blueprint are the blog posts..”. Don’t do that. The point is to clarify and communicate to the client value, not confuse them even more. Keeping it general and relatable. The other point is to keep it consistent. Change the metaphor if it’s not working, but don’t use a new metaphor each time you explain something. This will only confuse prospects if each discussion is different, or if they’re discussing something with an account manager at your agency. 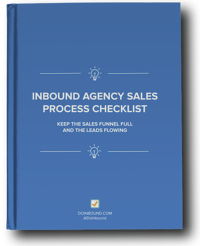 Keep it consistent, so everyone is on the same page, and prospects or clients aren’t feeling overwhelmed or confused. Metaphors are a powerful sales tactic your agency should be using to close more clients.